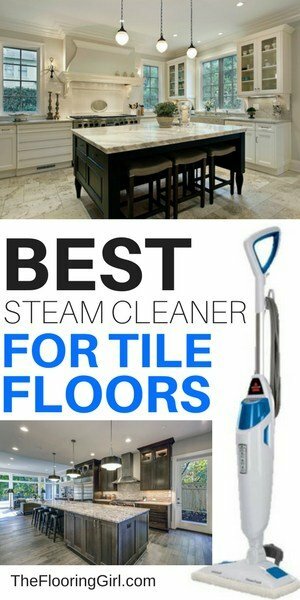 Many customers ask me about “What is the best steam mop for tile floors?” Many also wonder about the advantages of using steam mops over a traditional mop and bucket. 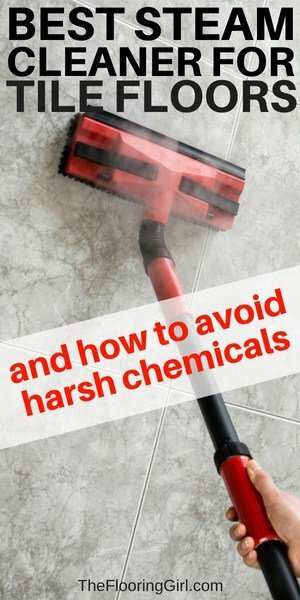 So I thought I would my share the steam mop that I recommend to my customers as well as some other cleaning and maintenance tips for tile flooring. This specific steam mop is the most popular with our readers. It’s an excellent steam cleaner specifically designed to clean tile and grout. It also works well on sheet vinyl and linoleum. It’s light weight and easy to use, and you’ll also find that it’s one of the most affordable hardwood steam mops you’ll find online. If you can get it for under $100, grab it. That’s one heck of a deal on a GOOD steam mop! (check current price). Steam mops are a favorite and ultimate convenience among homeowners who are tired of schlepping squeeze mops and messy buckets. Steam mops integrate water systems for less sloshing and dripping and the hot steam sanitizes and cleans the floors in just 1simple step. They are faster and easier to use. They are lightweight and also tend to be easier on your back. Importantly, steam mops tend to clean better…and, the steam sanitizes the floor WITHOUT the need for chemical cleaners. While they do cost more than a cheap squeeze mop, they last longer and will reduce the amount you spend on cleaning products. A good steam mop can blast the grime off of both the tiles and grout for a deep clean and sanitized environment. Not every mop will do this though…lots of mops will leave streaks and smudges. Even worse, some break down very quickly. Don’t be penny-wise and pound foolish here. It’s often worth it to spend an extra $20-$30 to get a high quality one that’s more effective (and whatever you save on the mop, you will probably more than pay for in extra pads…it’s kind of like printers where you can spend way more for the ink if you buy a cheap printer). So choose wisely (and see my top picks below). Obviously, cleaning you tiles floors is important for many reasons, but one step that many people miss is sealing their grout. Grout is made of sand, so it absorbs everything. So, if you see grout that’s become dirty and darker, it’s most likely that the grout hasn’t been sealed. When you seal the grout, it protects it and helps it last longer (and look nicer). You should seal your grout a week or two after installation…and generally reseal once a year. The good news is that this is easy to do, and you can do it yourself! See how to seal your grout yourself here. And, when you use a steam cleaner, it also keeps your grout cleaner (provided that you choose a good steam mop). Very low quality ones can leave grime behind which may in fact make things a tad worse. My top pick is the Bissell 1940 Powerfresh Steam mop. It’s super easy to use and customers love it. Check out the reviews on Amazon (there are over 9,000 of them! )..It happens to be Amazon’s best seller as well as the steam mop that they recommend. And, it’s reasonably priced. This steam mop kills 99.9% of germs and bacteria. The flip down easy scrubber allows you to clean the toughest messes – both on the tile and on the grout. n fact, It works twice as fast as comparable steam mops. It has variable steam control, so it allows you to customize the steam based on mess. The steam kills the germs. It’s the high heat that does it, and it allows you to avoid chemicals. The microfiber is easy to attach and detach. Having 2 types of pads (one for everyday use and one for tougher dirt) prepares you for every type of mess. The variable steam control (3 levels) allows you to make adjustments based on your need on different parts of the floor. For stubborn messes, you have leave it on the highest setting and pause the mop so that it will vaporize the problem area. This steam mop scrubs, sanitizes and shines your floors without the need without the need for chemicals. It claims that it’s safe for hardwood floors and laminate, but I would advise against using any steam cleaner on wood floors (see below). It’s easy to maneuver (only weighs 6 pounds) and it has a 23 foot cord, so it covers almost all rooms. The removable water container makes it super easy to refill with water. There are no triggers to pull or buttons to press. Just push the mop and it does the work for you. It only takes 30 seconds to warm up, and owners confirm that they have steam very quickly after they turn it on. The pads last a long time. And, you’ll be happy to know that you can throw them in laundry and reuse them. Oh, and best of all, it dries super quickly. I hate walking across newly mopped or wet floors (and I don’t like when my pets do either). Because the water is so hot, it evaporates so quickly, so usually by the time you’ve finished the floor, the rest will already be dry. This is super helpful if you have a bushy household or pets. A few complain that that the cover is cheap and water leaks out a bit, but this is easily solvable by putting in less water. This Bissell steam mop has an ergonomically sloped handle and soft grip making it comfortable to use, even for a long period of time. As a nice bonus, it comes with Febreze fragrance disks. And, it includes a 2 year warranty. Now this is a real gem…the cadillac of steam mops because it truly is multi-purpose. 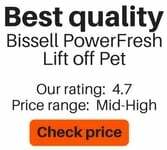 The Bissell PowerFresh Lift Off Pet does a lot more than clean tile floors. It includes a lift-off cleaner that can be used with 13 attachments including a grout cleaner, window squeegee, fabric steamer and brush attachments that will allow you to clean just about anything (including counter tops, sinks, tile walls and carpets). It also includes odor eliminating disks to remove pet odors and leave a fresh scent behind. Like the original Bissell PowerFresh, thiscomes with an integrated scrubber for tougher spots and the microfiber cleaning pads are washable. And, it comes with a 2 year warranty. If you have large areas of tile floors (e.g. whole first floor), you may be searching for an even faster way to breeze through the process of using a steam mop. If so, consider the Shark Genius Steam Pocket mop. This mop features direct-steam channeling that helps create a wider cleaning zone on large floors, while a steam blaster helps loosen the most stubborn stuck-on grime. It just makes the job go faster. As a nice bonus, this mop makes it super simple to change out the dirty cleaning pad and insert a fresh one – an important feature for larger jobs. You can do this just with the touch of a button, so that you don’t even need to touch the dirty one. The Shark Genius Steam Pocket mop also light weight (just 6 pounds) and comes with a 22 foot cord, so it’s easy to maneuver. And, it comes with 1 year warranty. 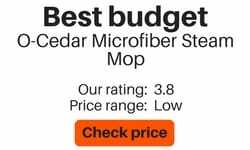 If you’re on a limited budget, check out the O-Cedar Microfiber Steam mop. It functions similarly to the Bissell PowerFresh, but it just doesn’t have all the extra features. It’s just 5 pounds and it also heats up in just 20 seconds. Features include variable steam control and even a snap on glider so that you can also steam your carpets. It comes with a 1 year warranty. 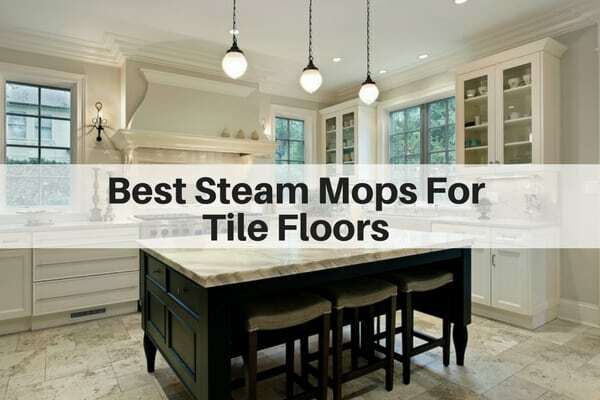 Many of these steam mops advertise that they are good for hardwood flooring. But, as a hardwood flooring expert, I would NEVER recommend a steam mop of any sort. Steam mops can easily wear down the finish as well as cause warping. Furthermore, if you use a steam mop, it will invalidate virtually all product warranties. Yes, I know people who have used steam mops and their floors and swear by them…or have never had a problem (at least as far as they know). 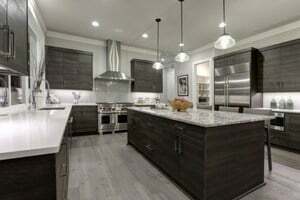 But, I would never recommend it, and I think you’ll be hard pressed to find any hardwood flooring pro or manufacturer that would recommend them. And, I would venture to guess that while it may be imperceptible to the visible eye, it probably wears down the floors faster. So proceed at your own risk. Instead, I would recommend a microfiber mop for regular cleaning. And, you may want to supplement with period vacuum cleaning. For hardwood floors, I recommend this Bissell Canister vacuum. You can read more about why you should be using a DIFFERENT vacuum for hardwood floors than carpets here. Before deciding on the best model for you, be sure to consider your flooring type. If you have flat tiles or sheet vinyl or linoleum, you can get away with most good steam mops. If you have deeper grout lines or very uneven tiles, you may be better off with a higher grade model.that has pressurized steam. With the newer engineered vinyl planks (e.g. Coretec Plus), I would double check with the manufacturers to make sure that a steam mop is appropriate. 1. Seal your grout. As I mentioned before, you should seal your grout a week or two after your tile floors are installed and then reseal it once a year. It’s an easy DIY project and you can read how to do it and find the right products here. 2. Avoid injecting too much steam. This can leave excess water in the grout which can cause mildew or mold. Use the mop in moderation, and you’ll be fine. 3. Always check the warranty on your floors. Steam mops are meant for sealed floors. I never recommend them for hardwood floors (of any sort). Check the warranty on the product or call the manufacturer if you are in doubt. It’s better to be safe than sorry. Probably the easiest and most affordable (and reliable) places to buy steam mops is Amazon. They have a wide selection, and usually the most competitive prices. And, of course shipping is usually free. The other great thing about Amazon is that you can read all the reviews…and they have thousands of them. Click here to check out Amazon’s top rated steam mops. I’ve also found that Wayfair.com has a wide array of steam mops as well. Their prices are also competitive, and they offer free shipping for purchases over $49. Which steam mop is best for you? My top recommendation is Bissell 1940 Powerfresh Steam mop. It does a great job, it’s easy to maneuver and it’s an excellent value. But, truthfully, all 4 of these options are excellent choices. Well, you certainly make me want to buy the mop, Debbie, and I don’t even do housework. Elizabeth – Oh that’s so funny. Your housekeeper can use it…everything will be cleaner…and no chemicals. Thanks for stopping by. We recently installed luxury vinyl plank by Armstrong. The manufactory suggest NOT to use a stream mop . What do you suggest i use? Darlene – I agree, you should not use a steam mop on any luxury vinyl plank (and I wrote that above). The heat can cause it to delaminate. Use Bona Traffic laminate and tile cleaner and a Bona microfiber mop or swiffer. Can I use a steam mop on ink jet printed tiles? Cheryl – I kind of doubt that. I wouldn’t risk it. Not sure how well in jet printed will work with any type of mopping. But, I suppose if it’s in a kitchen, move the refrigerator and try things in that section.